One of the best introductions in recent years, Dame Elisabeth Murdoch is a hybrid Tea Rose that will reach around 90 cm in height. Gold and cream flowers with a touch of red will vary in colour depending on the soil pH and the the amount of sun. This rose was released in 2000 and is named after Dame Elisabeth Murdoch who’s renowned garden at Cruden Farm at Langwarrin is a must visit garden in Melbourne. This is a fragrant rose, medium sized flowers that open from large pointed buds are on long stems. The foliage is good deep green and the plant will repeat flower from spring through summer into autumn. 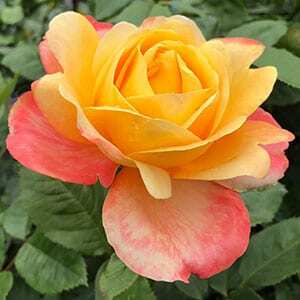 Use this as a feature rose near a pathway where the fragrance and flowers can both be enjoyed. It is also a great rose for cut flowers. Best grown in a position in full sun or at least 6 hours of good sun a day and a well drained soil, water your new plant well the day before planting and you are ready to plant. Weed the area well and dig the soil over. Dig in some well rotted compost and aged cow manure. Prepare a planting hole the same depth that the rose was in the container. Gently remove the plant from the container. Place in the planting hole and backfill. Water in well with a liquid seaweed fertiliser. Lightly mulch around the plant. Water deeply as the soil dries over the first spring and summer. We suggest using a general purpose rose food such as Sudden Impact for roses with an application every 8 weeks from early spring through summer. Regular seaweed fertiliser application will also help keep your Dame Elisabeth Murdoch Rose Bush flowering freely. Bare rooted and potted. Old World, David Austin, Bush & Standard Roses. Over 400 varieties available by Mail Order. Australia's leading rose supplier. Large range of all types, including new releases. Bare-root plants by mail order Australia wide, June - August. Visit our informative website. 100 page colour catalogue available. Huge range of potted roses available all year - weeping, standards, climbing, groundcover, bush, David Austin, Smooth Touch, Old World, New Releases. Rose Garden Design Service.